Lab processes for the research team are in varying formats, and may not encompass all relevant information and are not stored in the same location. This makes it challenging to cross-train staff, increase efficiencies and may lead to errors and re-work. When this problem is solved, the research team at the BCRF can increase work efficiencies, improve effectiveness of processes and ensure data quality and integrity. As of today, the research team cannot do this and our team will solve this problem by: a. standardizing the work and, b. developing Standard Operating Procedures (SOP’s). Our primary focus when developing an SOP, is the cotton moisture measurement of the samples. After this SOP is developed, then we will create a continuous improvement plan for future and existing SOP’s including SOP’s for all types of crops the BCRF accepts. Stephen Akol, Philip Hutson, Grant Ives, Allie Oder, Joseph R. Vanstrom and Jacek A. Koziel. 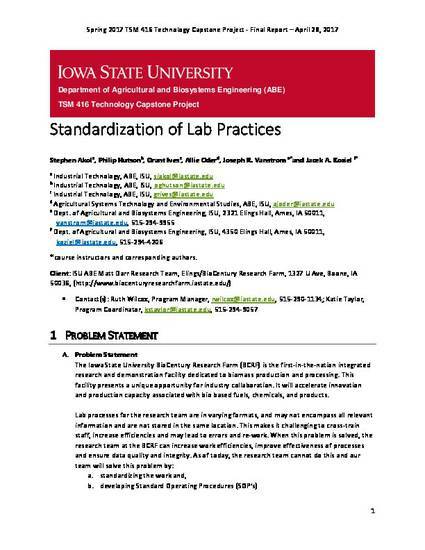 Standardization of Lab Practices. Final Report. TSM 416 Technology Capstone Project, April 28, 2017.